It's time! I am so excited to call this project done and share the final results with you. We started this project way too long ago and have spent time on the weekends slowly piecing this thing together. We took on every chapter ourselves, which we are quite proud of, ready to see the end product?! Get ready for a ton of photos! It's a terribly small space to photograph, and now with all the object in the room there are shadows bouncing all over the place, so please excuse that part! I'm sure this is the most clean and uncluttered this space will look for the unforeseeable future! Now for a little side by side comparison, where we came from and where we are today. I think we have stepped it up a notch! I am so glad that horrible tile is gone, so incredibly glad. In a bathroom I like to be practical with my accessorizing, especially with the space being so small. I found the shelf unit above the toilet at Target, and the set of wall hooks at TJ Maxx. This was totally a lucky find that I stumbled upon, I love the little label above each hook. I think hooks work so much better in a bathroom than a towel bar. We put them in our downstairs bathroom, and I will probably put them in every bathroom I have from now on. On the hooks the towels always stay put, and they still dry just fine. 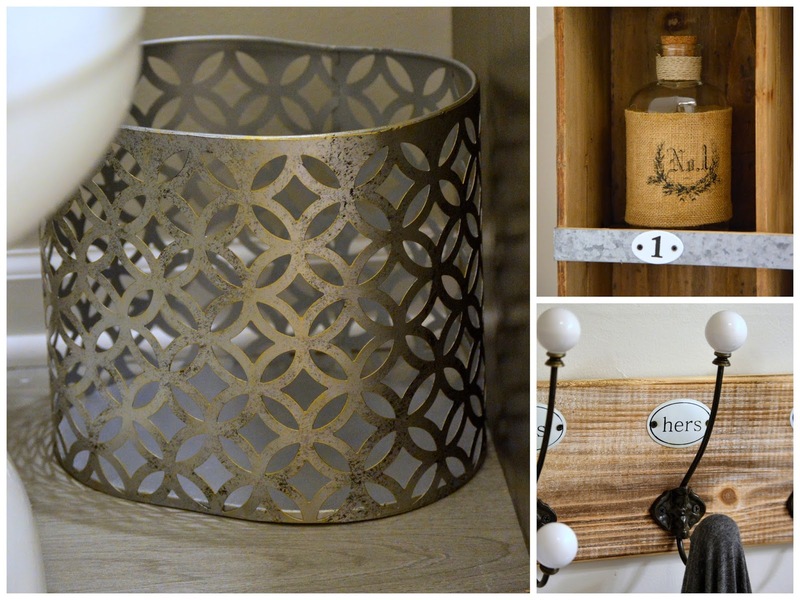 The wastepaper basket was a HomeGoods find. I love the design of it, but we will see how practical it is. I think it will be fine, but only time will tell! Here is a little close up of the vanity hardware I decided to go with. It's amazing how hard it is to pick this stuff out, I'm convinced it's just because there are way too many choices! I definitely hit multiple stores multiple times before deciding on these from Home Depot. Here is a little sneak peak at the other side. This also shows a late discovery that I had. I was standing in the tub as we were installing the new glass shower door when I looked up and saw my reflection in the mirror. I don't know why I never thought of that before, but now whenever someone is showering they will get a good view of themselves! Now if you turn around this is the new view that you get. Of course this side needs a little side by side comparison as well, this side is actually my favorite transformation. A million times better! I am so glad that gross tub and horrible step up that I almost killed myself on every time I stepped in and out of the tub are gone! The glass door was an Overstock find. They also sold it online at the Home Depot, but Overstock had the better price at the time. It attached to the wall with these hinges, which we learned through our own trial and error that they had to be pointing out into the room like this in order for the door to swing open as far as we wanted. And last, but certainly not least, look at the size of this tub. I am so ready, and excited, to take a much needed, relaxing soak in this tub! Next up I should figure out what we ended up really spending on this bathroom renovation, I'm just not so sure that I really want to know! I love that shelf above the toilet!! And the tiling in the bathtub makes the whole room look different! Love it! It looks FABULOUS! So glad you're done with it...and you truly have something to be proud of! I still can't believe you did all of this yourselves! WOW! What a transformation - your hard work definitely paid off. It looks absolutely stunning. What an awesome find on the towel hook rack by the way - I love the little labels. Enjoy your new space! Wow! What a lovely job you did. It looks great, Aimee! The towel rack is so fun with the labels and the tiling is gorgeous. Thanks so much Tori! I am excited that it makes the room feel more open than using a curtain. Thanks Becky - I totally just stumbled upon that shelf wandering around Target, as we always know is dangerous! I am so glad it's done too! Whenever we do something ourselves I have this slight fear that one day while using something it's all just going to fall apart! I still think that one morning I'm going to walk into my kitchen with upper cabinets laying on the floor since we hung them ourselves! Thank so much Karly! Gotta love TJ Maxx and HomeGoods for those awesome finds! I can't wait to take my first bath! Thanks so much! I'm glad we ended up going with the gray grout, I think it helps to make those tiles stand out. 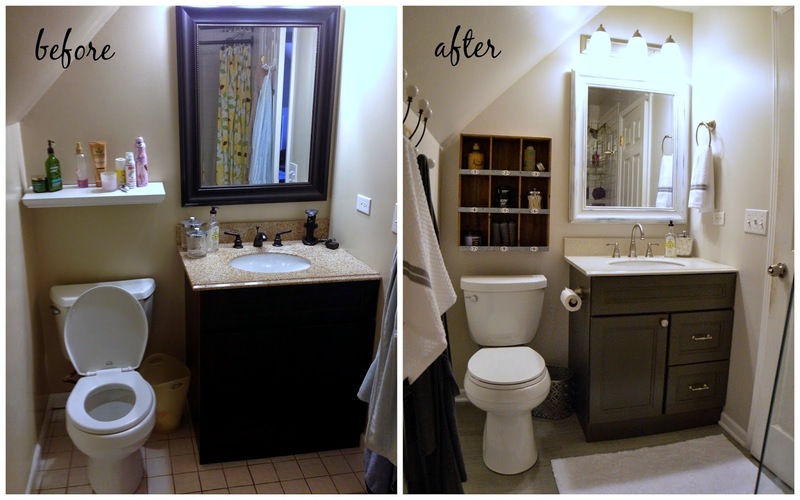 Absolutely in love with your bathroom makeover...top to bottom. I love the tiles, the cabinet color. I really love that little cubby thing above the potty. So vintagy-industrial! LOVE! You have great style!!! Thanks so much Leslie! I'm so glad I don't have to look at our old grungy tiles anymore, there are always those questionable moments along the way-but it came together! Featuring this post on Thursday!!! That's awesome, thanks so much Leslie! You did such an amazing job with the space! 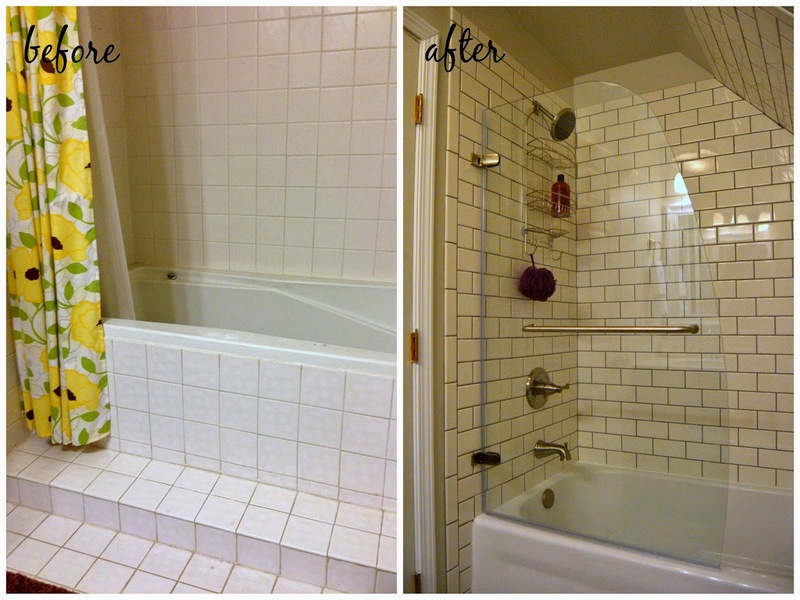 It's so difficult with bathrooms because the size is often super limiting, but the before and afters are incredible! Thank you so much Nadia! It can be hard with a small space, but sometimes it's nice because you don't have as much to fill!